The motto Veritas-Caritas receives its origin from Paul’s admonition to the Ephesians: “Rather let us profess the truth in love, and grow to the full maturity of Christ the Head” (Ephesians 4:15). It expresses a dedication to principles formative of mind and heart. The concept is likewise found in the seal which is highlighted by the Gospel Book surmounted by the Chi-Rho, representative of Christ, the Source of All truth and Truth itself. The Tau (Greek letter “T”), supporting the Gospel Book was often used by St. Francis of Assisi. For him it was a symbol of the cross and salvation; for us, it becomes a challenge to live a life rooted in Christ. 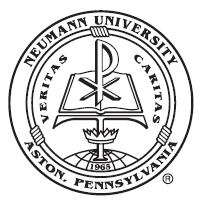 The Crown, encircling the Tau, symbolizes Mary, Queen and Mother, placed before us as a model of the virtues embodied in the mission of Neumann University. The Globe is significant of the scope of influence possible to those involved in the educational process at Neumann University, founded in 1965. The whole is enclosed in the traditional Franciscan symbol, the Knotted Cord, expressive of the vowed dedication of the Sisters of St. Francis of Philadelphia, the founders of Neumann University.